Featuring Benjamin Britten's only full-length ballet score, this ambitious reworking of The Prince of the Pagodas by Birmingham Royal Ballet (BRB) is as enchanting to the ears as it is to the eyes. The audience is swiftly whisked away to a faraway mystical Japanese kingdom as the stage is transformed into magnificently beautiful scenes, created by Rae Smith - the woman behind the famed sets in War Horse. 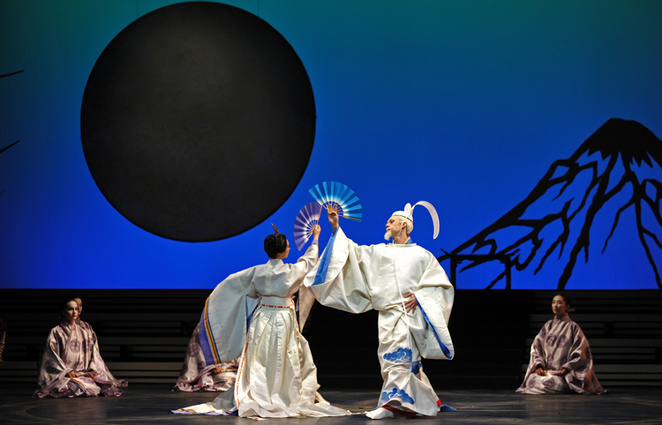 There's huge delicate and colourful chrysanthemum flowers adorning the stage while a snow-capped mountain teeters behind amid the pastel pinks and blues of costumes and sets, so often seen in Japanese artwork. It is in this beautiful, elegant Chrysanthemum Kingdom that we meet our heroine, Princess Belle Sakura - a young woman grieving the death of her brother many years ago. She is being forced to choose from four suitors by her pushy stepmother, Empress Epine (danced with zest and fiestiness by Elisha Willis). The four regal suitors - Kings of the North, East, South and West - lay out their store through a series of charismatic dances typifying each of the regions they are from. There's a jigging Uncle Sam, complete with hat, beard and stars and stripes suit; a severe looking, twirling Russian in fur hat and military coat; an animated painted African king; and serene lithe Chinese figure. When the Princess rejects all of these suitors despite her stepmother's anger, a fifth suitor turns up, who is a salamander (an excellent contorting Joseph Caley). The creature beguiles our heroine and spirits her away with his lovable sidekicks, who look like a combination of The Monsters meet Angry Birds. During the Second Act, which is the most visually spectacular, the Princess faces a journey challenging the elements of earth, air, fire and water before she confronts the salamander and realises that he is her beloved brother, who has been cursed by their evil stepmother. It is something that the siblings can finally put right. Each of the elements brings its own dancing surprises. We have adorable seahorses under the water; the finest moving effervescent stars and clouds you have ever seen; a wooded landscape with Balinese ladies; and rhythmic flames of danger as the whole stage dazzles in a vibrant red. It seems that BRB director and choreographer David Bintley has finally put right The Prince of the Pagodas ballet where previous productions have been slightly off the mark. Moving the story to Japan feels like a perfect gel for this fable, especially with the journey through the elements. Although, by making the Princess find her brother instead of a lover, it does mean that the pas du deux no longer has the sensual romance or passion often seen in other major ballet finales. Instead of love, we get war as the pair fight off the empress and other enemies to bring happiness to the kingdom in Act Three. And while it is a spectacular production, it perhaps lacks that crescendo memorable moment when two lovers dance. What we have instead is a technically good dance pairing without the extra emotion it needs. Momoko Hirata as the Princess is a tender, delicate dancer that fits well with the youthful role, but it is Elisha Willis who outshines her as the empress during the three hour performance. 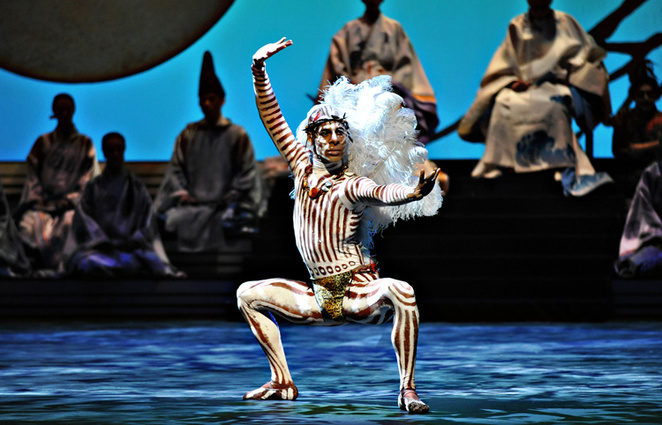 Despite having its world premiere in Tokyo by the National Ballet of Japan in 2011, this tour by BRB, which also takes in Plymouth and London after Birmingham, gives Bintley's work of art its first UK airing. It has been worth the wait as it is a spellbinding event for the senses that will leave a lasting memory. 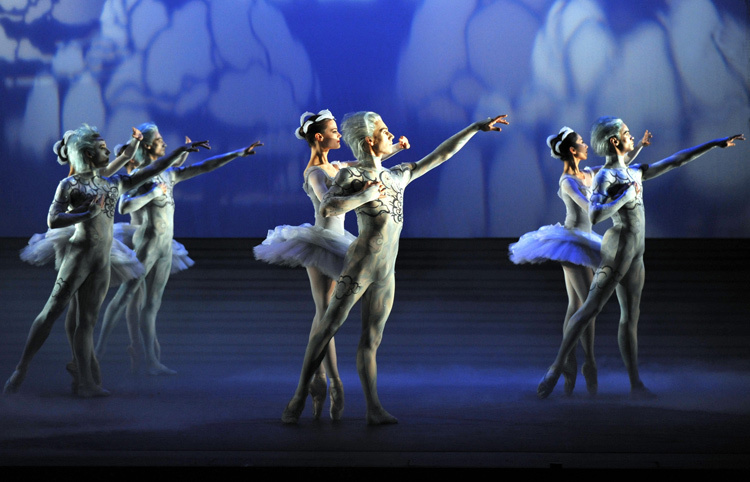 Tickets are priced from £18.50 and can be booked online through the BRB website. Birmingham Hippodrome - call 0844 338 5000 for tickets. Theatre Royal Plymouth - call 01752 267 222 for tickets. London Coliseum - call 020 7845 9300 for tickets.